Rembrandt Harmenszoon van Rijn July 15, 1606 – October 4, 1669) was a Dutch draughtsman, painter and printmaker. 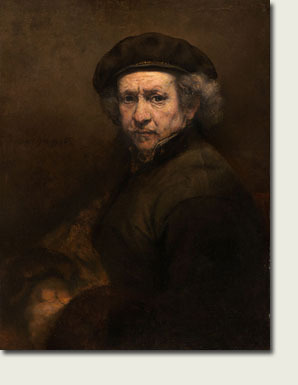 Known commonly only as Rembrandt, is considered a master of Western Art. With more than 600 paintings and about 2,000 drawings and etchings, (and even more that have been lost as time passed) he is one of the most prolific artists of all time. The variety of the subjects used in his work is amazing when compared to others who specialized in only certain types of painting. Nudes, landscapes, portraits, everyday scenes, birds and animals, historical and mythological figures, biblical subjects, and self-portraits are all to be found in his creations. Rembrandt was born in Leiden, The Netherlands on July 15, 1606, the son of a miller of modest means. His education was not neglected, but the university bored him and he later dropped out to study art. He began with a local teacher and then left to study in Amsterdam where he mastered his lessons in six months. He returned to Leiden and at only 22 was already taking on students. He moved back to Amsterdam in 1631 and later married Saskia van Uylenburgh, the cousin of a successful art dealer who would enhance his career, introducing him to wealthy patrons who commissioned portraits from him. His other paintings were greatly sought after and he was making enough money to afford a huge house filled with many famous works of art. Unfortunately, however, his private life was not so successful. Of his and Saskia's four children, only one survived infancy and Saskia herself died in 1642. He was forced to declare bankruptcy in 1656 after his ostentatious lifestyle exceeded even the substantial funds he was making as a painter, teacher, and art dealer. He was forced to auction off his treasured art collection as well as his house. He began to focus more on painting for his own enjoyment rather than for commission and his paintings from this time are thought to be his best, showing a depth of richness and spirituality missing in the precise brushstrokes of his earlier works.